The VERTEX 80 and the VERTEX 80v vacuum FT-IR spectrometers from Bruker are based on the actively aligned UltraScan™ interferometer, which provides PEAK spectral resolution. The precise linear air bearing scanner and PEAK quality optics ensures ultimate stability and sensitivity. The VERTEX 80v is an evacuated optics bench that can eliminate atmospheric moisture absorptions for ultimate stability and sensitivity; enabling challenging experiments such as high resolution, step-scan, ultra fast rapid scan, or UV spectral range measurements. The VERTEX 80/80v optics design allows PEAK flexibility and PEAK instrument performance at the same time. The unique Bruker Optics DigiTect™ technology ensures PEAK signal-to-noise ratio, prevents external signal disturbance, and allows easy and reproducible detector exchange by the user. The two optional external detector ports hold the liquid He dewars of bolometer and/or hot electron detectors. In combination with the external water cooled high power Hg-arc source, the recently rediscovered terahertz spectral range is accessible even with a room temperature operated DTGS-detector. It is possible to optionally equip the VERTEX 80/80v optical components to cover the spectral range from the far IR, or terahertz, through the mid and near IR and visible, and up to the ultraviolet spectral range. Maintenance and range change are easy with its pre-aligned optical components and the actively aligned UltraScan™ interferometer. BMS-c: The high-precision beamsplitter exchange option BMS-c for the VERTEX 80v vacuum spectrometer is provided by Bruker. The remotely monitored automatic exchange of up to four different types of beamsplitters under vacuum conditions is now possible. Now, the complete spectral range from the UV/VIS to the far IR/THz can be measuredwithout the need to vent the spectrometer optics bench for manual beamsplitter exchange. NEW: Through a new broad band far IR/THz beamsplitter for the VERTEX 80/80v FTIR spectrometer series Bruker has extended the available range of beamsplitters. The new far IR solid state beamsplitter will provide additional values for research and development of semiconducting and additional inorganic materials, as it covers nominally the spectral range from above 900 cm-1 to appr. 5 cm-1 in one measurement and connects the mid IR with the very long wave FIR/THz wavelength ranges. The VERTEX 80 and the VERTEX 80v standard configuration provides apodized spectral resolution that is better than 0.2 cm-1, which is adequate for most room temperature sample measurements and ambient pressure gas phase studies. A PEAK resolution of better than 0.06 cm-1 is available for advanced low temperature work, e.g. on crystalline semiconductor materials or gas phase measurements at lower pressure. This is the highest spectral resolution achieved using a commercial bench top FTIR spectrometer. A resolving power (wavenumber ν divided by spectral resolution ∆ν) of better 300,000:1 is demonstrated by high resolution spectra in the visible spectral range. The innovative optics design results in the most expandable and flexible R&D vacuum FTIR spectrometer available. With the evacuated optics bench, PEAK sensitivity in the near-, mid- and far IR regions is obtained without the fear of masking extremely weak spectral features by air water vapor absorptions. The VERTEX 80v vacuum FTIR spectrometer helps to obtain excellent results, e.g. in the area of nanoscience research down to less than 10-3 monolayers. There are virtually no limitations with respect to flexibility. Five beam exit ports on the left, front and right side and two beam input ports on the rear and right side of the optics bench are available. This allows simultaneous connection of, for example, a synchrotron light source using the rear side input port, the HYPERION series FTIR microscope at the left side exit beam, a bolometer detector at the left front, a fiber optics coupling at the right front side port, and the PMA 50 polarization modulation accessory at the right side exit beam. A network of intelligent functions such as recognition of optical components (ACR) and sampling accessories (AAR), automatic set-up and check of measurement parameters, and the permanent online checking (PerformanceGuard) of the spectrometer functionality makes FTIR spectroscopy fast, easy, and reliable even for advanced R&D experiments. The VERTEX 80 Series are the ideal instruments for challenging research and development applications. 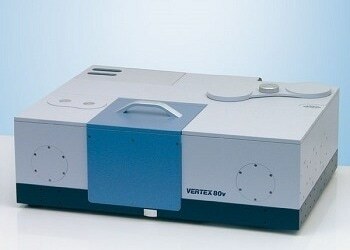 The VERTEX 80 and VERTEX 80v spectrometers are the high-end research instruments in the VERTEX series. Their innovative optics design results in the most powerful bench top purge and vacuum spectrometers available. They provide broadest spectral range from the UV/VIS region (50000 cm-1) to the FIR/THz region (5 cm-1), an unmatched level of flexibility and the highest spectral and temporal resolution. The PEAK technology of the versatile VERTEX 80/80v systems provides the right solution for all high-end research applications.